Keeping Somone Awake at Night? 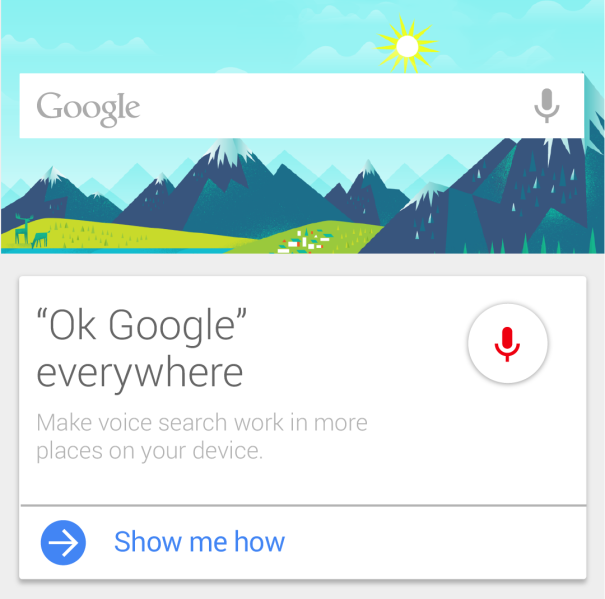 Android Kit Kat 4.4 has many advantages over previous versions of the Android OS but I would like to take a closer look at the Google Now voice command features. 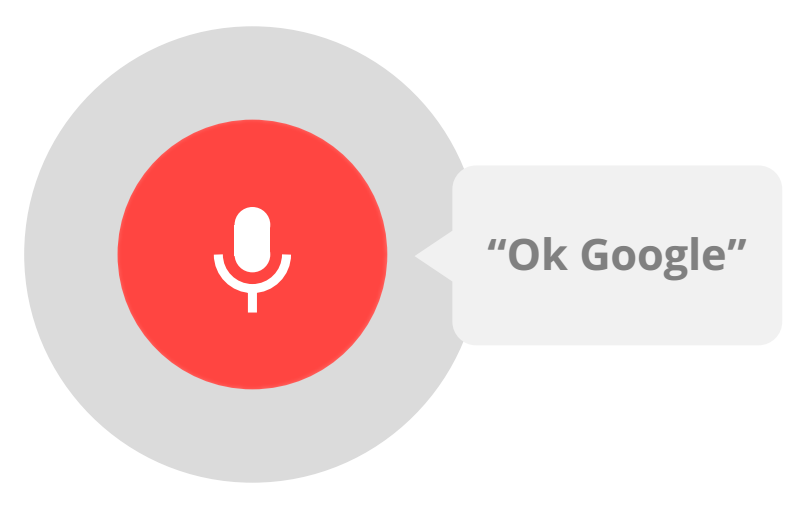 So you have Android 4.4 on your phone, you pick it up and say “Ok Google” to which you get a flashing red microphone icon, but now what? What do you say? What commands should you use? Well the Google Now function is surprisingly robust. It’s actually very good at detecting your voice and working out what you said, but other than for standard searches you need to use some set commands. We have listed some of these below to get you started. You can do a Google search for just about anything from ‘how old is Mickey Mouse?’ to ‘what is the capital of Honduras?’ and get remarkably accurate results. We think some of the best commands are for the navigation and communications functions and find to be the features We use most. We also thought We would share some of the more common commands so I’ve categorized them under the headings below and put them in  so they are easy to see. [Open], [name of app], as you can probably guess can be used to open anything on your phone from the picture gallery to games. [Take a picture] or [take a photo] lets you snap pictures with ease. [Record video] A good way to record video if your hands are full also not bad if you have your phone set up as a dash cam or you want to do a bit off spying. Call [Paul] or you can use any other contacts name or even relatives if your account is set up that way makes it easy to phone anyone in your contacts list. Send email to [Mr Smith], subject, [monthly sales report], message, [The quarterly sales reports show we have increased profit by 15% over the past 3 months]. This is a great way to reply to e-mails and dictate letters efficiently, it can be done while you’re on the go and don’t have time to sit down and type the e-mail. It saves a lot of time and helps increases productivity. Post to [Facebook] [Just watched the latest episode of Sherlock, was great!]. if you like your social media updaters then this makes posting super easy. [where is the] followed by almost anything, nearest coffee shop, best steak house, nearest police station the possibilities are endless and providing you have Google Maps you can get directions as well. [Navigate to] can be used before just about anywhere even business names and street addresses, although it may struggle to detect pronunciation of some foreign words, its an easy way to use your phone as a GPS and get full directions. Alternatively you can use the [Directions to] which like the navigate can be use with any locations or preset places in your Google maps such as [home] [work] [school] etc. [Where is] [the Big Ben] is another command that can be used with the maps to help you get around. And easier way to set your alarm [set alarm for] [6:30 am], you can even set a time [ set timer for 30 minutes] so you don’t forget to take your dinner out of the oven. Alternatively set a reminder [remind me to pick up the dry cleaning] and you can add times into this as well. This is just the tip of the iceberg and there are many more commands, you can visit the Google website here to view a comprehensive list of them (Google now commands list). Why not try some of the ones above and share your favorite ones with us. A wireless router allows an internet connection to be established without needing to have the connecting device in the immediate area of your internet connection. Not only does this provide more freedom on how and where you can use the internet but, it also removes the need for fixed network cables running around your home or office. The grater flexibility provided by wireless networks allows for computers to be moved around more easily so whether using a laptop, tablet or even your mobile phone you can easily connect from anywhere within the wireless range. 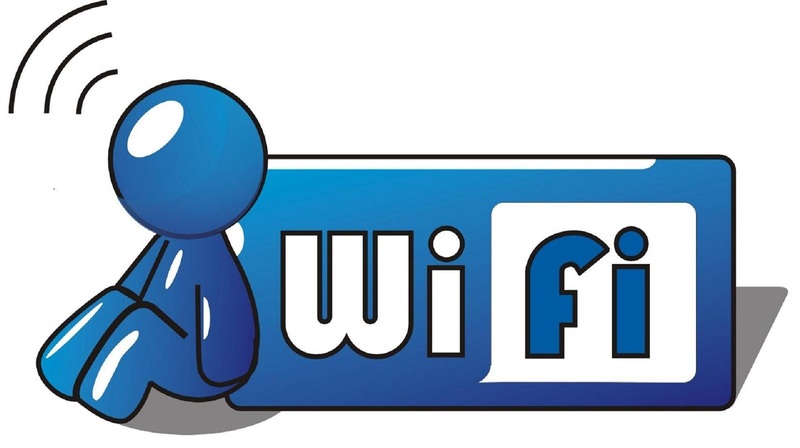 Wireless routers use 2.4GHz frequency to communicate over the air waves however, the further a device is from the wireless router and the greater the number of obstacles there are in-between the router and connecting device all have effects on the signal strength and range. 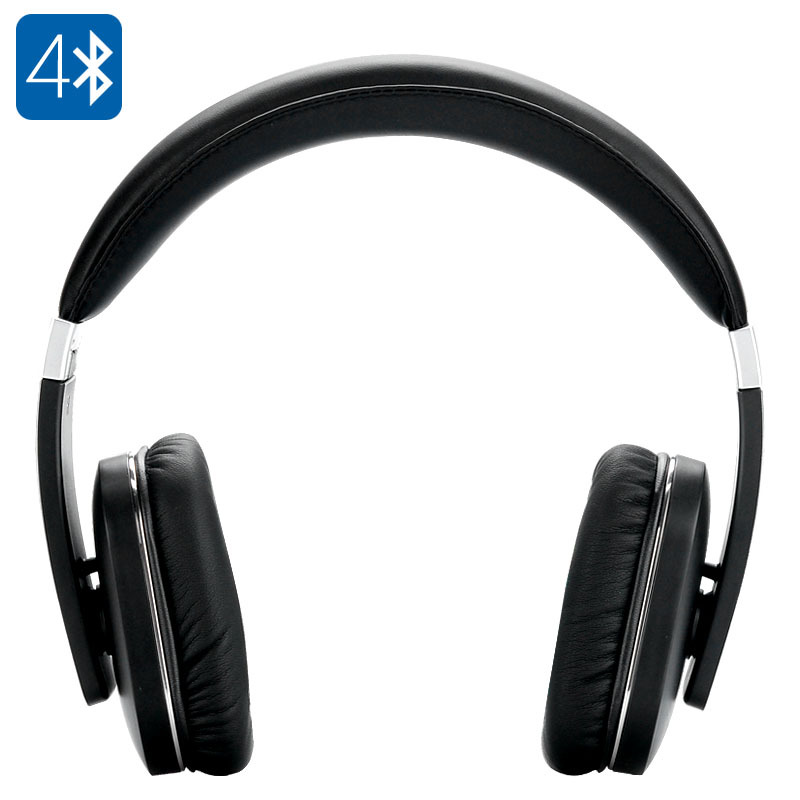 This can create various amounts of interference and severely restrict Wi-Fi usage. There are several ways to troubleshoot a poor wireless connection and to extend the range of a Wi-Fi router; here are the top 5 methods. Wireless signals can travels easier through the air than they can through concrete walls or other dens objects. Therefore ensuring a clear, visible path between the router and the connecting device, such as your computer, will improve signal strength and range, as well as reduce interference that will result in greater Wi-Fi speeds. When selecting where you want your Wi-Fi router think carefully about where you’re computer is and where you will be using the Wi-Fi. Wi-Fi routers operate at around 2.4GHz but they are not the only devices that do this. Many cordless phones and baby monitors also operate on the same frequency and if can cause interference if they are near the router or between the router and your connecting device. Additionally your neighbor’s Wi-Fi router could also interfere with the signals from your device so avoid putting Wi-Fi router next to or close to other wireless devices. Most wireless routers have omni-directional antennas so the wireless signal is emitted in every direction from it. This may be good if your Wi-Fi router is in a central location in your home or office but it’s not so good if it’s in the corner of your house. To get around this you could make a homemade reflector, upgrade the antenna or swap it for a more powerful uni-directional antenna aimed at the desired location. 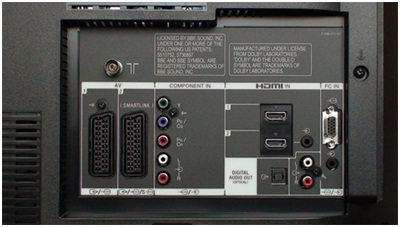 If you can find one of these that fits your router you can try getting a booster antenna. This will boost both the range and strength of the signal, these are usually omni-directional. These types of devices take in the wireless signal and then send them out with renewed strength, essentially boosting the signal strength so it can go further. Putting a Wi-Fi repeater between your computer and Wi-Fi router is a great and easy way to increase the Wi-Fi coverage and signal as well as to work around obstructions such as walls and furniture that will degrade the signal. If you have an older computer then the poor signal strength could be to do with the computers Wi-Fi capabilities rather than the router. To resolve this you could try using a USB based wireless adapter or update the internal wireless card in the computer. You could also see if there is a software update for your existing wireless card as this could also improve the signal strength and range. WorldofElectronics.ie has a range of wireless repeaters, boosters and portable routers that can help improve Wi-Fi signal strength and range in your home or office and are all available at wholesale prices. According to Akamai State of The Internet Report, which deals with the overall broadband connection speed around the globe, Ireland has been rated highly in terms of broadband coverage and speed. However the accuracy of the broadband connection speed is highly influenced by factors such as parallel web browser requests, small files slowed by TCP-slow start and IP address sharing. This calls for a more reliable indicator, which is the Average Peak Speed. It is also to be noted that fast broadband connection highly influences digital services like TVs which are connected and cloud computing. Broadband connectivity can also be directly correlated with an increase in a country’s GDP. In Ireland the minimum speed is placed at 30mbps in remote areas and increases to about 40-70mbps in the most populated areas and urban centers. Ireland has a digital agenda which envisages a 100% coverage of 30mbps by 2020, companies like eir.ie endeavor to roll out 1Gbps connection speeds in the near future. Ireland’s current broadband coverage stands at 98% for both mobile and fixed connections. 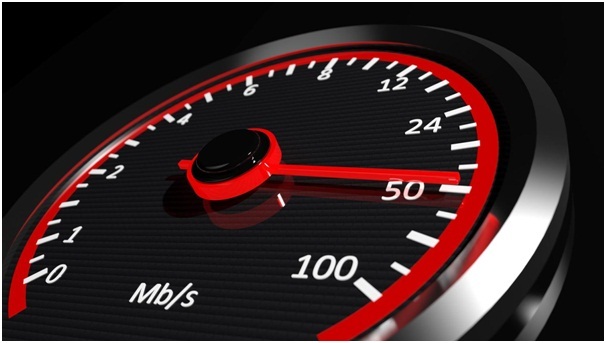 In terms of broadband average connection speed it was placed 4th in Europe and seventh in the world at 13.9mbps in 2014 and in the first quarter of 2015 placed 1st with speeds of 17.4 avg. and 60.7 peak Mbps. This is the case although it has a very slow roll out program as compared to other countries in Europe. Its position in relation to broadband speed places it above much stronger economies in Europe like the United Kingdom and Germany. Ireland therefore compares favorably with other countries in the European Union like the United Kingdom, which is actually said to have the best broadband network in Europe. This postulation has been developed by counter checking factors such as its take-up of super-fast broadband, speed and pricing. Other factors which affect the development of broadband connectivity and coverage are also in favor of the United Kingdom as compared to Ireland. These factors include its geography, population size and density as well as the take-up choice of Internet providers. It is said that Britain has a super-fast broadband up-take of about 73% and is ranked first among Europe’s five strongest economies with 30mbps speed. Compared to Ireland the UK has a higher uptake of 83%. It is also ahead in terms of usage, pricing and choice of fixed and mobile connections. Ireland fairs well against the UK when it comes to the average connection speed, which stands at 13.9 compared to UK which lies at position 18 with an average broadband rate of 10.7mbps. 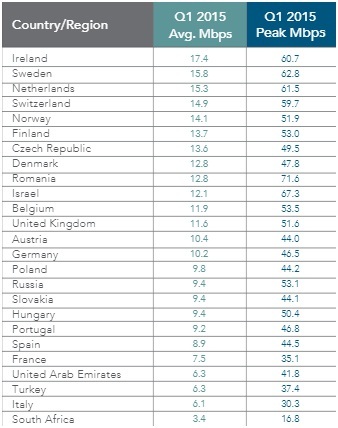 According to the 2014 Akamai report Spain has an average connection speed of 7.8mbps and lags far behind Ireland in that respect. It has an overall score of 0.49 and ranks 14th in the 28 European Union member countries. Major developments in broadband connectivity are ongoing in Spain and it has a 73% household broadband access which is much lower than Ireland’s 98%. As compared to Ireland many Spaniards have a low levels of digital skills (about 42%) and thus decreasing the demand aspect in connectivity and coverage. However, the supply side by Internet provider companies is very robust. Spain is therefore increasing its connectivity to meet the EU average broadband connectivity but slower than Ireland in terms of fixed and mobile connections. But to be noted, is seeing a faster increase of high speed fixed and mobile digital connections which should also put more focus in reducing obvious gaps between various regions that makes Spain lag behind in coverage when compared to Ireland. Ireland also fares better than Germany which is a power house in Europe. This is not only in terms of average broadband connectivity, but also in terms of speed and coverage. The two countries seem to be in the same league when it comes to Urban versus rural or remote areas broadband coverage. Germany’s densely populated areas, just like Ireland’s, enjoy faster Internet speeds and coverage as compared to those in the rural areas which have either slow broadband speeds or no broadband connectivity. ADSL is the most widely used type of broadband connection both in Germany and Ireland as opposed to the use of fiber optic or cable connection which is very expensive in terms of pricing. It relies on the telephone line to connect to the Internet. It is the cheapest broadband option for many in Ireland and Germany. Many people in Ireland avoid cable connections due to their very high prices and this is especially true for rural population whose choice of DSL far much exceeds fiber optic subscriptions.